Pop corn that can be made in the microwave has been a popular speedy snack for years, but now it has just got even better, fresher and tastier! Baby White Pop-A-Cob ZaraMamas Microwave Popcorn Gourmet Popping Corn is virtually hull-less tender kernels with a mild melt in mouth flavour, simply microwave the cob in the bag provided for approx 2 minutes, for super fresh popcorn straight off the cob! Other ZaraMamas Pop-A-Cob Microwave Pop Corn packs are available at TAOS Gifts! Many people love popcorn with just a sprinkle of salt or sugar, but you can add that little extra special something with ZaraMamas Gourmet Popping Corn Seasoning each pack is a mix of 2 flavours with 2 of each flavour per box. Or you can buy a pack with a mix of all the flavours to find your personal favourite! Once you have tried some of the delicious varieties from the ZaraMama Gourmet Popping Corn Range, you may want to try a few of the selection boxes, available in variety packs or Cinema Popcorn Pack Gift Packs, perfect for lazy nights in or novel gift for other fans of this healthy natural snack. Popping oil is UK grown, cold pressed extra virgin rapeseed oil, it has a light nutty flavour and a high smoke point making it ideal for popping corn. If you are looking for healthy, delicious treats and snacks, look no further than ZaraMamaS Gourmet Popping Corn! ZaraMamaS gourmet popcorn is available in 11 different and colourful varieties, each one has it’s own texture and natural taste: buttery, dry, sweet, crunchy and chewy. Autumn Haze is small red and yellow kernels with a sweet mellow flavour and light crunch. Baby White Rice has virtually hull-less tender kernels with a mild melt in mouth flavour. Baby Yellow Rice is a pack of tiny yellow tender hulls, that are easy to eat and digest. Black Mountain Pops up brilliantly, white and crunchy popcorn with a buttery nutty taste. Blue Seas is an unusual miniature blue kernel, tender and rich. Creamy Crunch is white popping corn, pops up light and crispy, sweet and creamy. Fiery Amber is gold and red striped kernels that give you large fluffy, flavoursome and buttery popcorn. Midnight Blue is creamy, chewy and intensely flavourful, large fluffy pop. Rich Ruby Red is a selection of deep red kernels with a distinctive light nutty flavour. If you can’t decide, you can buy a colourful mix of all varieties to pop together. Whirley-Pop Hand Crank Popping Machine helps make perfect popcorn every time! No more shaking the pan to ensure the corn gets evenly heated, just turn the crank to keep the popcorn moving. The Whirley-Pop Popcorn Popper also allows moisture to escape during popping, so your popcorn is always tender, crispy and ready to serve, enabling you to rustle up a healthy and tasty snack in minutes. Introducing the wonderful floral and fruity scents from the Made By Zen Signature Range of fragrance Oils. They are exclusively blended using natural fruit and floral oils, luxurious creations that are unique and distinctive, helping to create the right ambience that will compliment any mood and provide the solution to aroma boredom. Serenity is a beautifully pretty, soft and soothing scent which combines peony with white rose, honeysuckle with a hint of musk and sandalwood to complete the blend. A perfect, white bouquet which brings an air of serenity to any space. Paradise gives a tropical feel, with a delicious blend of Mandarin orange, Caribbean pineapple, cane sugar and coconut blended with sandalwood, musk and a hint of vanilla to create truly exotic fragrance. Spoil your senses with the exotic beauty and vitality of a tropical paradise. The oils are ideal for use with Made By Zen Ultrasonic Aroma Diffusers, oil burners, lamp rings and for refreshing pot pourri or dried flowers. Moroccan Rose is a voluptuous scent, a blend of the world’s most exquisite roses. Clean and delightful, this blend is rounded off with the sensual woody notes of amber and musk. A truly romantic homage to the rose. These concentrated fragrance oils come in a in small 15ml bottle, but a little goes a long way! Click here to see the full selection in stock now! Essential Oils have been used for hundreds of years in various treatments and therapies to help create ambiance, to heal, sooth, refresh, calm and energise. 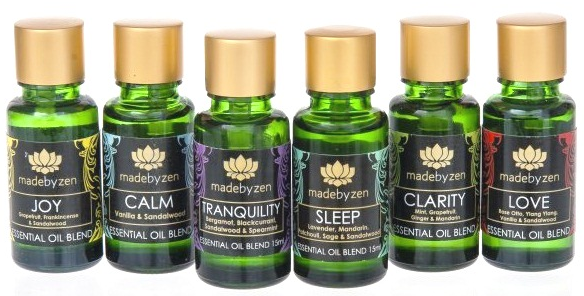 Made By Zen is a wonderful selection of essential oils already blended for you ready to use with Made By Zen Ultrasonic Aroma diffusers, oil burners, lamp rings and for refreshing pot pourri or dried flowers. Using only pure essential oils, madebyzen™ has created the ultimate collection of essential oil blends that are unique and desirable. The blends are 100% natural and use the purest essential oils. The Purity Range is a wonderful collection of fragrances to soothe, relax and calm as well as to boost and lift your senses, a selection for every occasion. 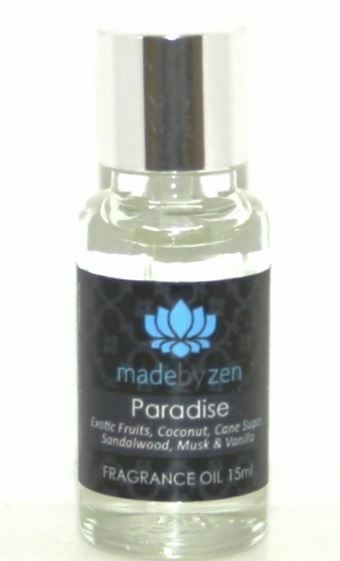 Made By Zen Happy is a 15ml Blend of calming cinnamon, zesty orange and sweet rosewood pure essential oils. Calm, with Vanilla and Sandalwood is a warm and sensual blend that calms, soothes and creates a peaceful and happy scent that is ideal for relaxation. Inspire is a blend of violet, cedar & chamomile. Light floral and uplifting it helps to inspire and motivate. Sleep contains a blend of pure Lavender, Mandarin, Patchouli, Sage and Sandalwood essential oils to help you unwind relax and have a good nights sleep. s a wonderful blend of Bergamont, Blackcurrant, Sandalwood and Spearmint essential oils. You can view the full range in stock at TAOS Gifts by clicking here.